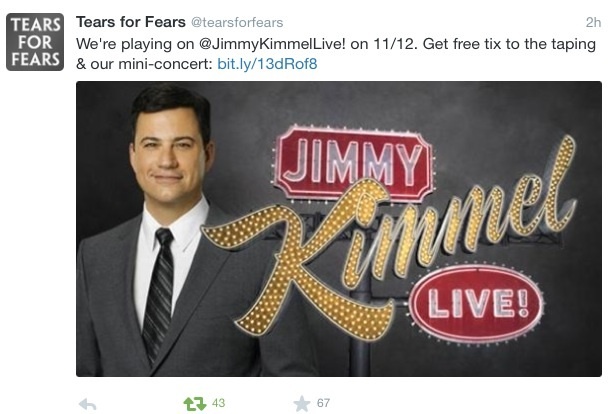 Tears for Fears will appear on Jimmy Kimmel 12 November. So, you got tickets to go see Tears for Fears on Jimmy Kimmel Live and the cool concert to follow at the venue… Congrats! This is not easy! It’s a lottery. So many sat with anxiety praying they’d actually get the tickets. There is one other site 1oita.com that can help you get tickets to his show (if you want to try again for a future show or if you’re in the area). When the band was on JKL some years ago, fans did attend. We do not have any reviews or travel fan accounts of that other than the YouTube videos we featured in our TBT’s Deja Vu post. But you can guarantee this is worth it and will be fun! Arrive early! Be on time and read the information given to you very carefully. Any email correspondence and other details MUST be read as there are, every now and again, updates. So, again, can’t stress this enough…READ YOUR CORRESPONDENCE. For detailed reviews on how JKL works from a fan/attendee perspective please click here and read the experiences of those who have gone more than once. Tears for Fears in Concert -Gold Baby, Gold! There is a concert as part of the show! It may not be a full set but it’s a concert nonetheless and that’s worth its weight in gold. Again, arrive on time and get in line early because eventhough we have read through info, etc it’s not clear to us just yet the seating and who enters the concert area first, etc. One guy arrived at 1:45pm in the past (to be on time and get the scope) so again, just be orderly and get there. These are our recommendations within a few miles or around the corner from the studio. These should be no more than a $15 taxi or Uber ride to the venue. You may even be able to walk. *There are other options further away, pricing ranging between $170-$350 per night. Email us via Tears for Fears & Kooks for alternatives if you wish. Again, if you can, book through the hotel directly and use any discounts they provide. We can’t guarantee anything when you use third party vendors. Why are we only learning about this now? You do understand this is like…two weeks away, right?! – We, again, have to wait on the band to announce/confirm online before we go posting things to the internet. It’s to protect ourselves and others. We heard about this in Oklahoma but were not sure whether what we were being told referred to a past show or a future show. We didn’t want to be nosy and say, “Can you repeat that? Jimmy Kimmel what?” We will in the future in case we need to prepare anyone interested to get their wallets ready. we looked up round trip from ATL to LAX, Yikes! 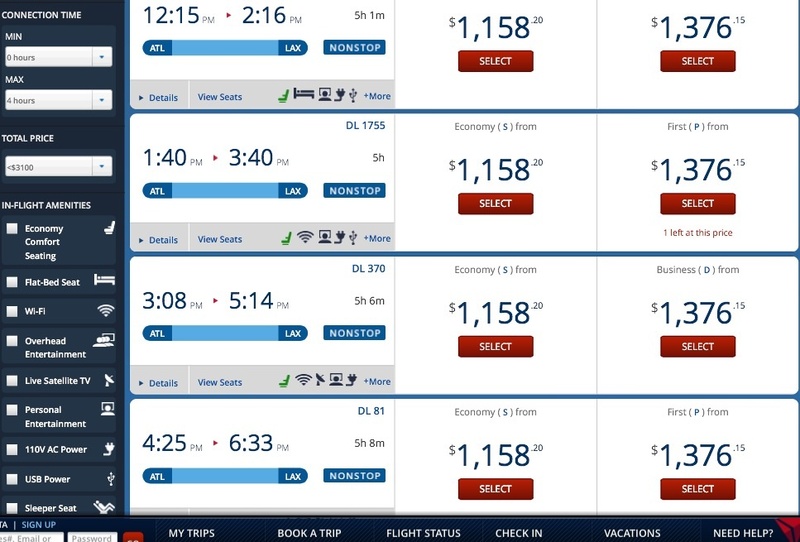 What is up with the airfare from the East Coast? $1,000?- Yeah, Andye has contacted Delta, SK has checked with other airlines. We’re going the extra mile to see what can be done to find something lower than the $1100+ prices we’ve been given. Total cost for a 2 day stay in L.A. at the moment under these rates puts us at approx $1700. Which is approx $700 more than usual. We’ll be in touch if we get any relief. Is this the last show of the year? – We were told that there wouldn’t be any further touring within 2014. However, shows like these and other appearances are not out of the question perhaps. What if we just can’t go? What do we do? Is there any solace? When we couldn’t make it down to Brasil/Brazil, we got a hotel suite, logged into the hotel’s wifi and stayed in touch with other fans at the show the whole night. So, if you can, gather with fellow fans in your area, get dressed up as if you were going and enjoy that show on a big screen somewhere. Make it a party, submit your pictures, tweet, go all out! TFF celebrations happen every month in various locations around the world…join the online party! Hashtag #TFFOP Jimmy Kimmel airs live on ABC at 11:35pm ET/10:35 CT nightly. Ths show will take place on the 12th of November. We hope this info has been helpful! Please contact us re: Travel Fan questions, logistics, pricing and suggested x,y,z via our TFF Travel Fan Facebook page. Up Next On Air – Sunday 2 November on NPR, Tears for Fears will be mentioned in a segement titled “Art Imitates Life” on weekend edition. You can visit wabe.org’s live stream to listen to the feature segment. Weekend Edition airs from 8am to 10am Eastern. The segment will air sometime during the show. Up Next on Blog – Team CS Holiday Givings Project – all encouraged to give or donate to their fav cause. We’ll have list some of those that Good Man Curt Smith has mentioned this year. Previous Previous post: The Marvelous Mr. Moyer, The Sax Man! Next Next post: Tears for Fears In Concert – Vegas Baby!